Robert Shiller called it “irrational exuberance”. John Maynard Keynes called it “animal spirits”. John Coates, the author of The Hour Between Dog and Wolf, explains how testosterone and cortisol are the yin and yang of market sentiment. The book explains the link between hormones and markets and shows how an investor’s physiology changes throughout a market cycle. I finished the book having a better understanding of how our bodies respond to taking risk, and how to avoid the hormonal pitfalls that detract from performance. The link between our body and brain isn’t a one-way street. There’s a significant amount of body-brain feedback and our physical hormonal response influences our mental decision making. Steroid hormones ensure our body and brain work together. Testosterone rebuilds energy stores and cortisol breaks down energy stores for immediate use. 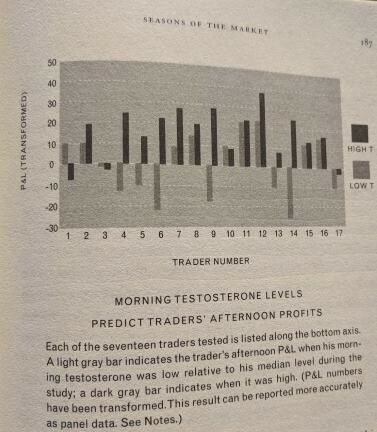 Testosterone and cortisol levels can wildly vary and shape investor behavior. Daniel Kahneman (of Thinking Fast and Slow fame) changed his stance on intuition. Kahneman initially thought intuition wasn’t that useful because he originally studied it in fields like political forecasting and stock picking. Kahneman partnered with Gary Klein (who mainly studied firefighters and paramedics) and they concluded that intuition can be relied upon, but only if two criteria are met: 1) Someone has to work in an environment that’s regular enough to produce repeating patterns, and 2) They need to encounter patterns frequently enough to learn from feedback on their performance. Information is pleasurable. The novelty of new information is interpreted similarly to pleasurable activities like eating and drinking. These activities cause a release of dopamine which then motivates us to seek it out again. Give an animal the choice between eating or self-stimulating with dopamine and it will self-stimulate until it starves. We’re hardwired to crave risk-taking. Dopamine surges after a unique action leads to an unexpected reward. The amount of dopamine released is related to how unexpected a reward is. Dopamine is addicting. Profits gained after taking excessive risk leads to more dopamine when variance grants you the inevitable lucky coin toss. I know I am lazy, but a link to buy the book would be helpful. It is there. Click on the links underneath the images.